As a realtor, I am in the business of finding people their home. As we approach the holiday season, it is now my dream to gift a family their home, and I would love to count on your support to make this happen. CLICK HERE TO DONATE NOW. Meet the Sanchez family. They live in El Crucero, a humble community in the outskirts of Managua, the capital. El Crucero is known for its cold temperatures and often inhospitable terrain, as it seats on a ridge that weathers volcanic fumes from the Masaya Volcano. Melvin is a gardener and earns US$8 per day. He has a family of four to support, that includes his wife Meyling and their four kids: Rosa Idalia (13), Axel Josue (11), Helena Gabriela (9) and Melvin de Jesus (4). The Sanchez family lives in precarious conditions, vulnerable to the weather and the conditions of the area. Their home is small, consisting of only two rooms, walls made of old roof materials: zinc and lead sheets and a damp and bare dirt floor. My dream is to be able to build a home that would offer better shelter and safer conditions for the family. We have the access to buying the materials and accessing the labor required to build a similar home such as this one below. Our approximate budget is U$4,000 and my family is committed to matching the highest contribution. I will be reporting back and every dollar will be accounted for. As a donor, you will receive a full report of how your contribution was used. The goal is to be able to complete the house in early 2019. This is a very special cause and a way for you to directly impact the needy - especially, given the tumultuous situation in Nicaragua. I will be in Nicaragua next week and I would love to share the news and know that you will help. Every year, when our family visits Nicaragua, we gather in the Crucero community church to share some fun, break a piñata and bring small gifts to the children in the community. This year I need your help to make a bigger impact. 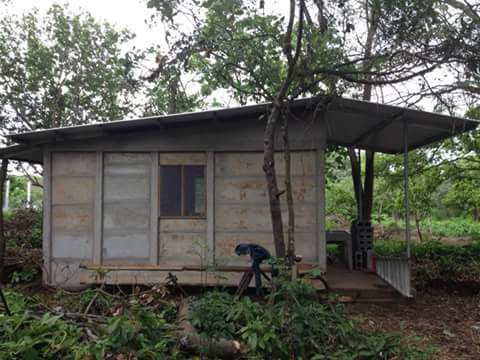 You can access the Campaign and its progress HERE via Go Fund Me or check out www.Gofundme.com and search for the Melvin Sanchez, A Home for a Nicaraguan family. Thank you in advance for your help and thoughtfulness! Halloween is one of our family’s favorite holidays. We love dressing up and of course eating some candy! The preparation starts months before, when we start discussing and deliberating the year’s theme. For many of my clients, this will be the very first Halloween in Miami, and therefore, I have compiled a list of the best kept secrets about each of the neighborhoods. Both these events/venues are ideal for little ones, as they happen the weekend prior to Halloween Day (10/31) during the morning/afternoon hours. Zoo Boo (Saturday 10/27 and Sunday 10/28): A day event where little ones are encouraged to dress up and trick - o - treat at the Miami Zoo. The events includes special Halloween themed activities and performances, plus you can stroll the Zoo grounds at your leisure. Monster Splash Hosted by the Miami Seaquarium (Friday 10/26 - Sunday 10/28): The classic Miami landmark is taking over by ghosts and goblin in a fun-filled (daytime) event. For grown ups, you must plan ahead, both The Biltmore Hotel in Coral Gables (SOLD OUT) and Vizcaya Museums and Gardens (SOLD OUT) host pretty spectacular affairs. If you are in the mood to party, there is still time to enjoy a spooky night at the beautiful Fairchild Gardens, as they will be hosting a Ghoulish Garden Halloween Bash. You can still get tickets here. You can start early and head to Halloween on The Mile (3:30pm - 7:00pm) and Trick-o-Treat along Miracle Mile or enjoy the various activities the city has planned including Looney Tunes Halloween shorts at the Coral Gables Art Cinema and a Kiddie Costume Contest at the Actor’s Playhouse (limited to the first 100). More info here. If you want to trick-o-treat like a local, I encourage you to check out the famous Santa Maria Street, where you will stroll under the shade of the oaks and the most beautiful mansions in the North Gables. A tip - be prepared to park and stroll early, as getting to Santa Maria can be a challenge later in the day. Across US-1, you will find the most welcoming and neighbor-friendly stretch of trick-o-treaters, hosts and ghosts on Aduana Street, which tends to get going after sunset. This eclectic neighborhood never disappoints. This is where our family usually spends Halloween night. You can’t beat strolling through the neighborhood’s mysterious streets, and its dark alleys will showcase spooky surprises. The spookiest dead-end is Irvington Street, which in year’s past has been filled with surprising and mesmerizing encounters. Residents of this cozy street go all out in celebration of Halloween. One year they hosted the scariest Haunted House and I recall seeing an abandoned car with the letters “UBER” imprinted in blood. Irvington is best after dark and best for older kids. Perhaps my most unique Halloween experience has been the Trick-o-Treating in The Haunted Mooring Fields at the Coconut Grove Sailing Club. This is a wonderful and whimsical outing where kids and member families head out to the waters on a dinghy and trick o treat from sailboat to sailboat, all moored across the Club on Biscayne Bay. It’s just magical! Pinecrest Gardens will be hosting their Howl -O-Ween Event on Sunday, October 28th where kids and their doggies can dress up in costumes and participate in a day full of fun, featuring a very exclusive Doggie Fun Zone. On Halloween Day Pinecrest residents and their friends are invited to drive/walk to Evelyn Greer Park (8200 SW 124 Street) for Track or Treat, an event organized by the Village of Pinecrest happening from 5:00pm - 7:00pm. The City of South Miami will host its annual Spooktacular Safe Street Halloween Party from 4pm - 7pm on Wednesday 10/31. Details can be found here and the location is on Sunset (72nd Street) and Red Road (57th Avenue). Other popular neighborhoods on Halloween Day include Schenley Park, Key Biscayne and the Brickell area. In Brickell, the fabulous Brickell City Centre will be hosting the 2018 Hallow Bash from 5:30pm - 8:00pm on Wednesday, 10/31. Kids, families and doggies are all welcomed to dress up and have fun! More details here. If you plan to leave your home and still would welcome trick o treaters, I would encourage you to leave a bowl of candy or treats on your doorstep. I know your neighbors will appreciate it! If you are interested in exploring these neighborhoods and you are looking to make Miami home, contact me today (305) 607-5938. Here is a follow up to my post on Asian food in Miami (The best Chinese and Thai restaurants in town). Today, I’d like to share a list of spots for authentic Indian, Vietnamese and Indonesian food in the greater Miami areas. These are not popular cuisines in the sunshine state, therefore, to savor some of the exotic flavors, be prepared to drive a bit. Bombay Darbar (2901 Florida Avenue, Coconut Grove) – The secret is out. This is the best Indian restaurant in Miami. I think most Coconut Grove locals would argue that this is also one of the best restaurants in their neighborhood. In their new bigger location, Darbar is bustling any night of the week. Flavors are spot on; be sure to ask for tandoori lamb chops, Chicken Korma, Paneer Makhani and an assortment of naans and samosas which will parade in your table and will be an explosion of flavor. Make a reservation or get there early. This is a great option for large groups as it can be surprisingly reasonable when sharing dishes. Anyone from the local or international Indian community living or visiting Miami will know about this place. There are a few known names out there promising to replicate the freshness and color of the Vietnamese cuisine, yet in my opinion, most are mediocre. You will have to venture out to sample some of the better ones. Basilic Vietnamese Grill (14734 Biscayne Blvd, North Miami Beach, FL 33181 - Smart eatery offering a pretty extensive list of authentic Vietnamese dishes. They actually own two other locations in Broward (Boca and Lauderdale). One of the few places that also serves the famous Vietnamese baguette sandwiches (Bahn Mi). Portions are generous, ingredients are fresh and colorful. Everything I tried was delicious and authentic (I’ve survived a trip to Hanoi and Saigon which perhaps make me credible). Worth the drive and good for a date (if you don’t mind that’s smacked in the middle of a strip mall). The ambiance is refined and the menu is extensive. Tip: the famous Oishi Thai is across the street, which also commands respect for its Thai and sushi offerings. Green Papaya (16893 NW 67th Ave, Miami Lakes, FL 33015) – I must mention Green Papaya because I love mom & pop operations. These ladies cook, serve and smile when you walk in. It’s not in the most interesting or convenient location, unless you are shopping nearby at the giant Brandsmart (it's listed in Miami Lakes but others say this area is considered Hialeah). I enjoyed it. This is a pretty authentic Vietnamese spot. I had a hearty Chicken Pho and the most delicious gooiest sweet doughy treat as dessert. They must have figured out that I have a soft spot for jelly-mushy unappealing Asian treats, as the taro-pudding-sticky-rice with red bean concoction they brought me (without having it ordered myself) was divine. Good spot for lunch and a totally no-frills locale. Bali Cafe (109 NE 2nd Ave, Downton Miami, FL 33132) - This place has been in Miami for years. It’s a Downtown institution. Not sure what brought the owners to Miami, but I will sure find out next time I’m there. Indonesian food is indeed delicious, complex in flavors and requiring detailed preparation. Must order: laksa, Nasi Goreng, Rendang Sapi (it’s worth sticking to the Indonesian recipes). Best for pickup or delivery (check out UBER eats / Grub Hub), as the dining area is small and parking scarce in the streets of Downtown. Note that it’s cash only. Having lived and traveled in Asia extensively, one develops a passion and TOTAL addiction for Foot Massages. I’m not talking about the dodgy experience, I am referring to the legitimate art of giving your feet the much needed care and attention. Your feet are often the most neglected part of your body. Upon returning to Miami, I noticed a few places with the suspect neon sign promoting an “Oriental Massage” and in no time I was hunting for the right one. I recommend a MASSAGE shop found in a strip mall near the airport (at 5773 NW 7th Street, right next to the Office Depot; telephone 305-456-1835). This is as legitimate as it can get: $45 gives you 60 minutes of bliss, where you will be cocooned in a velvety chair while listening to Chinese tunes, all in a big communal semi-dark room. The (likely) legitimate Chinese masseuse will wash your feet and devote over 40 minutes to your beloved feet. The massage will end with a quick body stretching massage of about 10-15 minutes, unless you specify otherwise. Be adventurous and stop by. They accept credit cards. The price is right, the place is clean and the experience is worth it. However, be humble and open minded, and remember that this is not the Mandarin Oriental, it's a no frills almost therapeutic activity. Tip: they open late, which makes it a nice post dinner or evening outing. For more on Miami...whether it's the restaurant scene, Asia in Miami or your local real estate needs, contact Valeria at valeria.avirett@gmail.com. We lived over three years in Hong Kong and we were spoiled. We traveled and sampled an incredible array of delicious and authentic food. Since our arrival back in Miami, I set off on a mission to discover and find out where Asian Food was to be had in this town. My recommendations are as authentic and unique as you can get in Miami. Are you rich? Then you must own in Miami. Fort Lauderdale seats quietly 30 miles north of Miami. For years, it’s been a city known for its white sand beaches, intercostal water views and canals. It’s a boating and yachting haven, playing host to one of the largest Boat Shows in the world. With a recently expanded international airport connecting it to major corners of the world, the city of Fort Lauderdale is experiencing a rebirth. I was fortunate to get up close and personal with one of the most successful brokers in real estate: Don Pingaro, ISG Asia Partner and Broker and also the force behind Ocean Insiders, who has brokered more than $550 million in deals. The new year is always a great time to reflect on past experiences and set the goals for the road ahead. Therefore, I find it suiting to reflect on some of the major Miami real estate news/events of 2016 and what they represent for 2017. In this post I mention the most memorable new projects and the fact that we are in a buyer's market. Live in the Grove or love to visit? read up on my tips and my favorite places to wine and dine! Coconut Grove is loved for its relaxed and bohemian attitude, and its beautiful green and luscious streets. I am always out and about discovering new places. My recommendations are usually hidden gems or establishments that are truly authentic or what they do, they do it well. In Coral Gables, my favorite neighborhood, I love to eat, shop and wonder in the following locations.